VAN NUYS, Calif. (Nov. 15, 2018) – PSSI Global Services, the industry leader in broadcast engineering and event management solutions, has been awarded a Technology & Engineering Emmy® Award for its work with NASCAR to develop cutting-edge transmission schemes for large-scale “at-home” productions. Presented by the National Academy of Television Arts & Sciences, the award recognizes PSSI Global Services’ significant accomplishments in broadcast technology and television engineering. 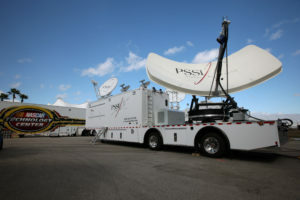 In early 2018, PSSI Global Services utilized these transmission capabilities in partnership with NASCAR to successfully conduct the largest at-home production to date for the Rolex 24 in Daytona, Florida. The transmission from the event back to NASCAR’s headquarters in Charlotte, North Carolina, included 28 video paths and 75 channels of audio delivered synchronously for 32 consecutive hours. To accomplish this groundbreaking at-home transmission, PSSI Global Services needed just two transponders on a single satellite, accessed with one antenna and one solid-state amplifier. PSSI Global Services will be honored alongside NASCAR and the year’s other Technology & Engineering Emmy Award Winners on April 7, 2019, during the National Association of Broadcasters (NAB) show in Las Vegas, Nevada. 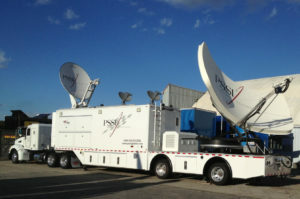 For more information on PSSI Global Services’ transmission capabilities and accomplishments, visit http://www.pssiglobal.com.